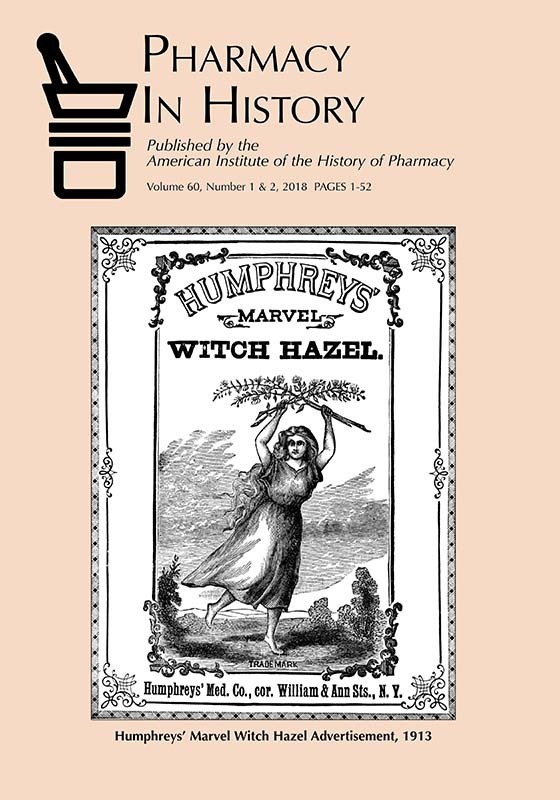 AIHP is pleased to announce the publication of the latest issue of Pharmacy in History, volume 60, number 1 & 2 (2018). The lead articles are “Francis Peyre Porcher, M.D. : Botanist, Physician, Pharmacist, and Scientist” by Amy Gregg, which explores the career of this trailblazing nineteenth-century medical botanist, and “‘Good Enough for America’: Adulterated Drugs and the 1848 Drug Import Act” by Dennis Worthen, which recounts the history of America’s first adulterated drug crisis. Research Notes include the articles: “Earliest Known Black Graduates of the Philadelphia College of Pharmacy” by Daniel J. Flanagan, “High Potency Machines for Remedy Preparation in American Homeopathy” by Heike Gypser, and “William Brooke O’Shaughnessy (1809–1889) in India” by Harkishan Singh. The Bookshelf includes Dennis Worthen’s review of Blitzed: Drugs in the Third Reich by Norman Ohler and Glenna R. Schroeder-Lein’s review of Recollections of a Civil War Medical Cadet by Burt Green Wilder and Richard M. Reid. AIHP members with access to the Pharmacy in History JSTOR archive can view the content immediately.